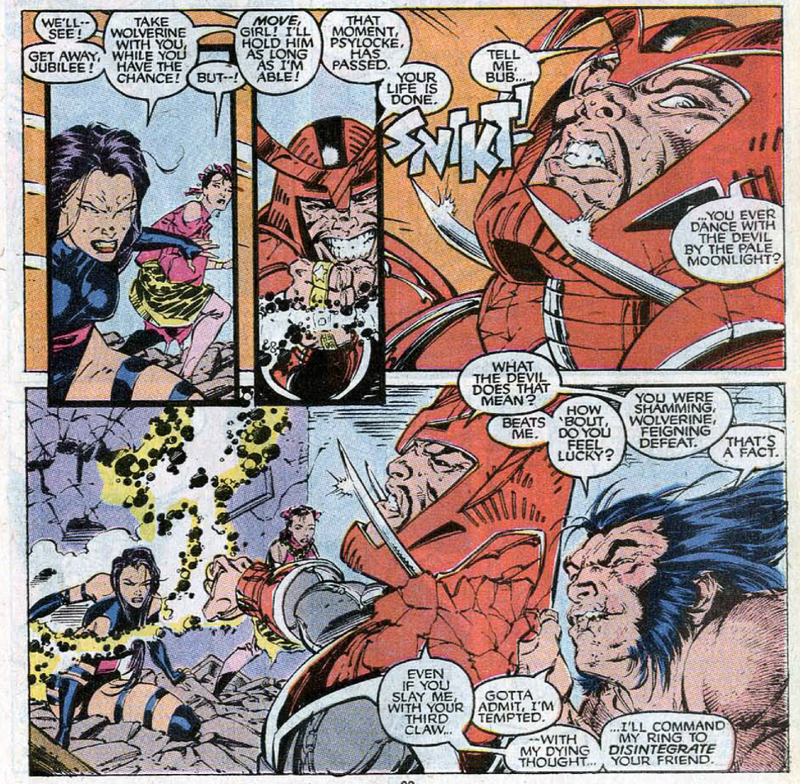 Later, Psylocke arrives at the Mandarin's villa, where's he taken Jubilee, and presents the body of Wolverine, telling him he'll be of no more use to the Hand. The sight of Wolverine seemingly dead causes Jubilee to trigger a massive explosion, giving Psylocke an opening to attack the Mandarin. He battles her to a stand still, but then Wolverine, alive and well, pops up behind him, claws at his throat, and the two agree to part ways peacefully. 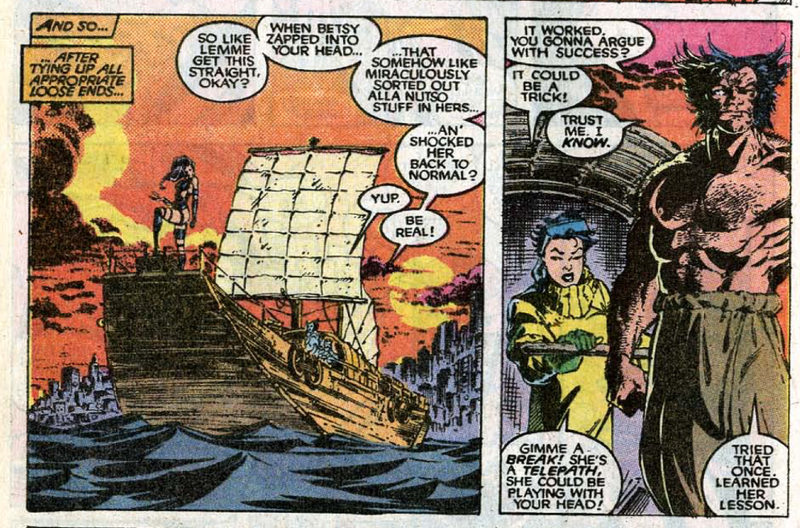 Later, Wolverine and Jubilee are joined by Psylocke as they sail away from Hong Kong, Wolverine explaining that when Psylocke entered his mind, it shocked her back to her senses. 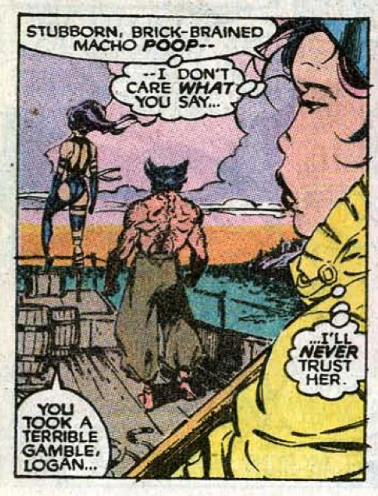 Jubilee remains distrustful of her, however, and Psylocke herself asks Wolverine how he can trust her when she's not sure she can trust herself. To which he says he has no choice. With Psylocke throwing off her Hand conditioning and joining up with Wolverine and Jubilee, this issue marks the completion of the final set of characters the book will rotate in and out of focus during the Non Team Era. This issue involves Matsuo and the Hand attempting to do to Wolverine what they did to Psylocke, brainwashing him into becoming their assassin (which Matsuo feels is suitable revenge on someone who has been such an enemy to the Hand). 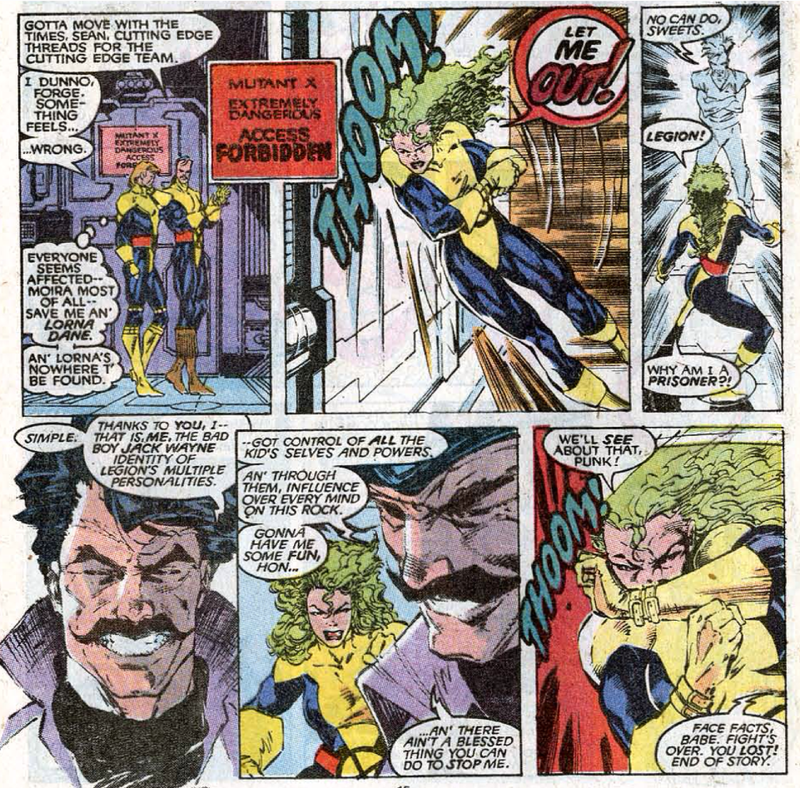 Obviously, by the end of the issue, Wolverine has resisted their efforts, but had Claremont stayed with the X-Men, one of his long term plans involved the Hand eventually succeeding in turning Wolverine into their assassin, having begun the process in this issue, at which point he'd spent a significant amount of time as a villain before dying. Much later Mark Millar basically did the same story in the pages of Wolverine's solo series, during the "Enemy of the State" arc. Banshee and Forge adopt the unified yellow and blue X-uniforms this issue, and both will remain the characters default looks even after the '91 relaunch, when everyone else either gets a new, individualized costume or returns to their old individual look after wearing the uniforms for awhile. Legion has locked Lorna in Mutant X/Proteus' old cell, and it's revealed that thanks to Lorna, Jack Wayne, the evil personality within Legion, is able to access all of Legion's powers and be in control. Jubilee is able to use her power to trigger a big explosion, larger than anything she's yet done, indicating just how powerful she has the potential to be, which will be a recurring beat for the character moving forward. Similarly, Jubilee is (understandably) distrustful of Psylocke once she joins up with Jubilee and Wolverine, a feeling she'll continue to espouse during their time together. It's noted that both Wolverine and Psylocke remain invisible to detection from electronic devices. 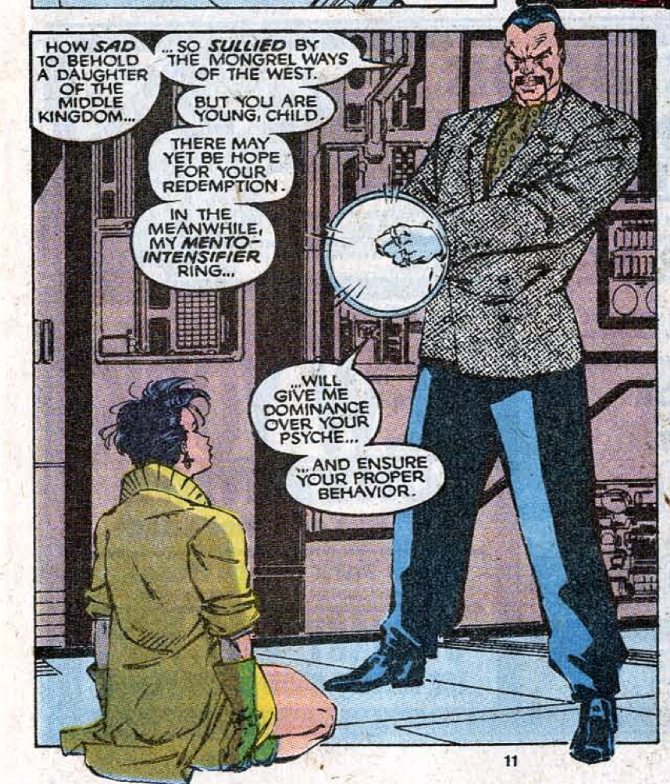 The Mandarin is dismissive of Jubilee, saying she has been sullied by mongrel Western influences. Claremont hangs a lantern on the randomness and abruptness of the plot resolution via Jubilee. Wolverine says that his inner ghosts are now running free in his mind, to an extent that not even Professor X would likely be able to help him, which is part of what helped shock Psylocke back to herself. Wolverine asks the Mandarin if he's ever danced with the devil in the pale moonlight, another Batman '89 reference (followed by a Dirty Harry one). At one point, "mask" is spelled "masque", though maybe that's just a lettering error. Psylocke' psychic knife is still just the "ultimate focus" of her abilities. Claremont is maybe trying out some new terms, as "Menstat" and "Skull Scanner" are both thrown out at different times as synonyms for telepath; I don't believe either ever sticks. Wolverine is confronted in his mind by images of the women he's loved: Jean Grey, Mariko, and Yukio. Notably absent from that list: Heather Hudson, Silver Fox, every woman that's since been retconned as having been a love of Wolverine's life. But for all that, this is still a fun, reasonably well-constructed story. A tad abrupt is probably better than long-winded and decompressed, and while the full ramifications of Psylocke's transformation never really get the attention they deserve, that's more a failing of later stories/missed opportunities than of this one, which is chiefly concerned with the initial transformation and immediate fallout. The Lee art is, of course, a big part of that draw, injecting a ton of energy into the story, but Claremont also seems to be having fun, playing with some of his favorite tropes (physical transformation and mind control) outside the confines of the traditional team book structure and peppering the story with plenty of exciting, cheer-worthy moments. For all it's faults in execution, this story remains a highlight of the book's non-team era. Tomorrow, Rob Liefeld comes to town in New Mutants #86. Friday, X-Factor comes home in X-Factor #51. Next week, "Acts of Vengeance" Part 4. 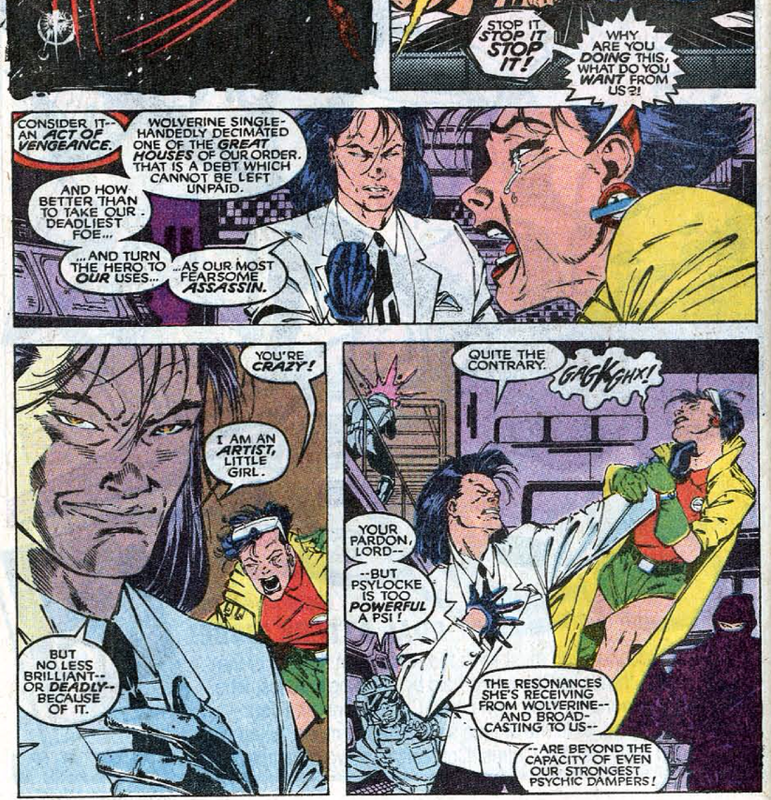 "Legion has locked Lorna in Mutant X/Proteus' old cell, and it's revealed that thanks to Lorna"
Banshee should have been a bit more curious as to why there was someone in the Mutant X cell, no? "The Mandarin is dismissive of Jubilee, saying she has been sullied by mongrel Western influences." While the 3 issue arc is a good one, this issue is definitely the weakest of the 3. 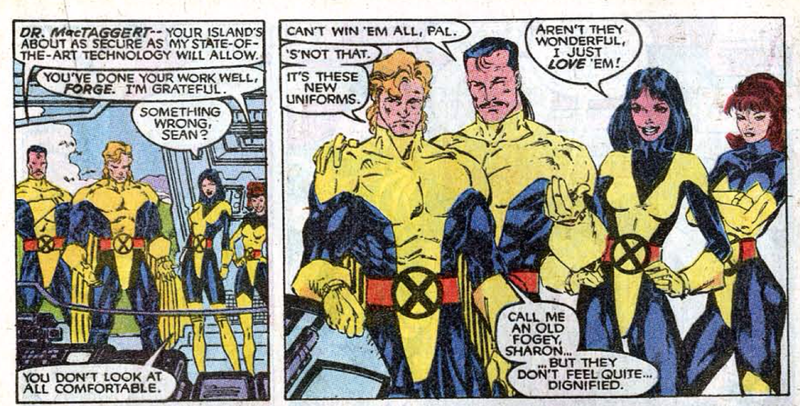 It should be noted, however, that this is the first time any of the X-men have been reunited since # 250. The most interesting one is that Nicieza did it face make a mistake and not realize/check that Psylocke was still untransformed and naked when the Hand found her (it's the third Urban Legend in the trio). Embarrassing that nobody at Marvel caught that mistake, especially Bob Harris. And it makes Nicieza's whole retcon even more pointless. @wwk5d: Banshee should have been a bit more curious as to why there was someone in the Mutant X cell, no? I'm under the impression the door is usually shut, and it's soundproof - he gives no indication of hearing her banging away inside. It should be noted, however, that this is the first time any of the X-men have been reunited since # 250. That is worth noting. I may edit something in. I kinda love that. Vulture does a similar thing in tomorrow's New Mutants. Had you not mentioned Proteus here, I would, because that's a totally awesome Easter egg to slip in here. Of course, the chances for you not to or someone here not catching it was zero, because it also is obvious to anyone familiar with the classic Claremont/Byrne. But anyway. The important thing to take with you here is that if someone is going to push you into soundproof cell to be forgotten, be sure to hit a teeth out of that someone. Come on, it was only a normal-sized issue. Having only read the X-series Acts of Vengeance crossovers, which were so tangential, I liked the name-checking of the actual title too, both here and in Goodwin's Wolverine. Nice, simple, unobtrusive way to tie it in without making an X-fan feel like they were missing out by not reading the core AoV titles. Oh, also wasn't it "mentat," not "menstat" ....? "I'm under the impression the door is usually shut, and it's soundproof - he gives no indication of hearing her banging away inside." Yeah but for me, why would it be shut if it hasn't been used since Proteus, and why would the warning light be flashing, and damn, I think about this stuff way too much, don't I? I think I mentioned this before, but I seriously don't get Banshee's issue with the new uniform. It seems to be that he finds it too tight/revealing? His old costume was just as tight! If anything, I'd say the new uniform should be a little more dignified than his previous outfit because, in narration if not in the art, we're told that it has special armored padding. I'm pretty sure the original Banshee suit was just a skintight leotard. I've never understood why Wolverine, Psylocke, and Jubilee didn't move into Wolverine's solo series at this point. Jo Duffy took over the series for a while after Byrne and Goodwin left, and I believe she and Claremont were friends, or at least they had been at one time. You'd think Claremont might have briefed her on what she could and could not do, then let her go with this trio, letting them have adventures in Madripoor which could then later be threaded back into UNCANNY. Then, when the team was united again eventually, this arrangement could have been reassessed (I believe Larry Hama would be the WOLVERINE writer by that point -- not sure how close he and Claremont were). Matt, I don't see how Harras would have dedicated two books to be by the vision of Claremont at that time, considering how very soon he won't be giving that courtesy to even one book. WOLVERINE has by this time developed a bit of its own voice in pulpy adventurousness and I don't think the editorial is into having an X-MEN vol. 2... well, obviously not by Claremont's vision, at least. Now I start to wonder for how long the adjectiveless was in the works, and if turning WOLVERINE into the second X-MEN book at this point would have ruined those ideas. 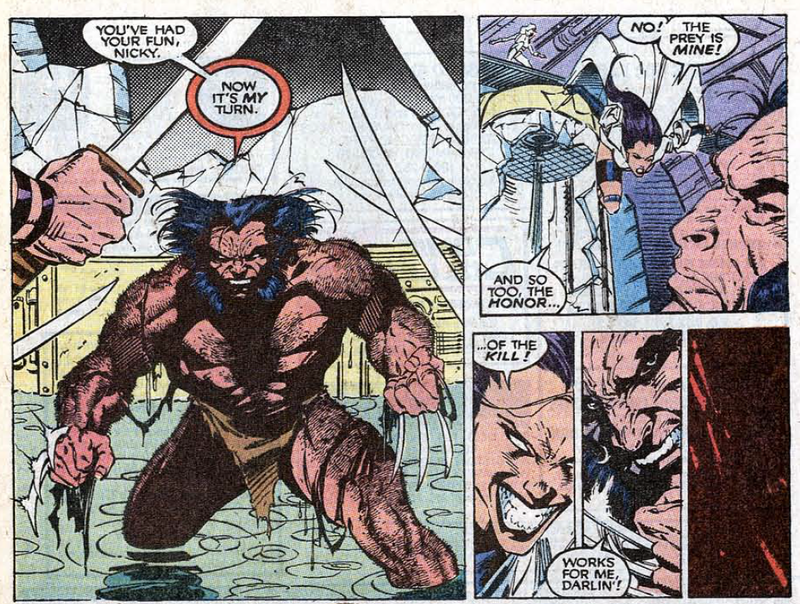 @Nathan- part of the problem was that Hama didn't want to write "Dark Wolverine", which was his right. From Harras's point of view, if Claremont wanted to do the Dark Wolverine Saga, he never should have stopped writing Wolverine. 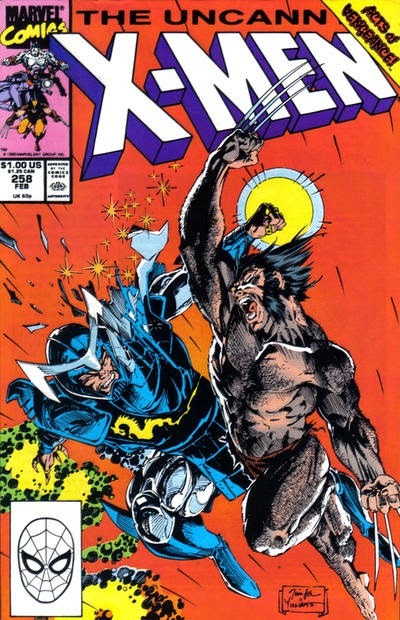 Claremont's response was that he never wanted the Wolverine book to begin with and it was difficult to write an extra book, especially due to the biweeklies. "there's definitely something problematic in the idea that it takes Wolverine's mind to snap Psylocke back to herself, robbing the central character of this arc of her agency, recasting her as someone rescued by Wolverine"
But that's largely the problem with a lot of Claremont's arcs- the women don't change their personalities of their own volition. Tyger Tiger got kidnapped and mind-controlled, Maddie got tricked by S'ym and here Betsy got kidnapped by the hand. Of course, Lorna shouldn't probably shouldn't wearing the newer costume stuck in that cell. 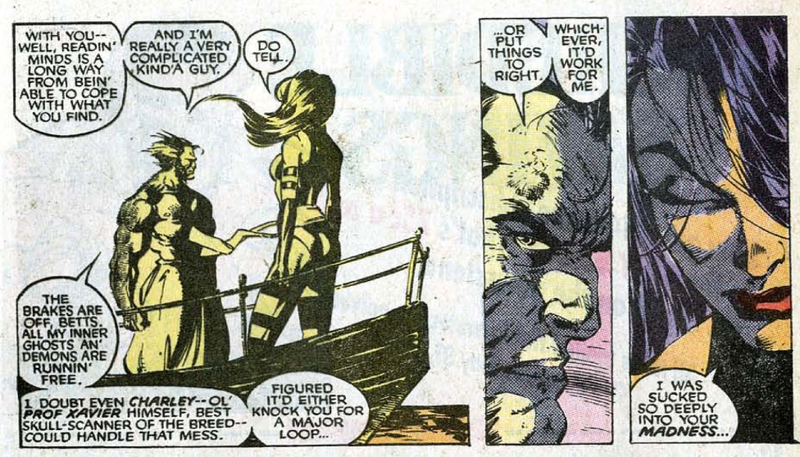 While I could be wrong, the backlit, monochromatic blue figure facing Wolverine in the first panel of the "ladies Logan loved" sequence felt like it was not meant to be Jean but someone else. In favor of this theory is how she seems to be wearing leather based on the texture of that shine, and the fact that the black tendrils in the next panel suggest that her form has just morphed into Jean's. Against this theory is the fact that only Jean, Mariko, and Akiko are name-checked verbally, although it's possible Claremont didn't pick up on what Lee was suggesting. Does every AOV chapter have a villain spontaneously use the phrase "act(s) of vengeance"? Here it came off more a lot more naturally than usual, granted, but it's usually good for at least one massive eye-roll per issue. It's "mentat" and not "menstat", as Jason says. It is kinda gaudy that a mental encounter with the shambles of a consciousness that is Mr. I-Don't-Even-Know-My-Own-Name is what shocks coherence into, y'know, a goddamn telepath. Over/under on percentage that Betsy has been poorly written? She was a mess from the early 90s until, what, Uncanny X-Force? @Blam: So any suggestions which female in his life Lee might have been suggesting the backlit, monochromatic blue figure in leatherpants facing Wolverine to be? I meant Yukio, not Akiko... Sorry, Mark Crilley. Unfortunately not. I did wonder if it was supposed to be somebody we could suss out or a reference to somebody from his past we haven't met yet (which at this point would still be merely a fun and reasonable open-ended question rather than another straw on an already-broken camel's back of hints at Logan's history). @Blam: Given she was in leather shorts it can't have been that far back in Logan's history since they were primarily a late-80s phenomenon! First of all, everything I said about #257 still stands. In fact more so, since the Mandarin brings into the forefront. 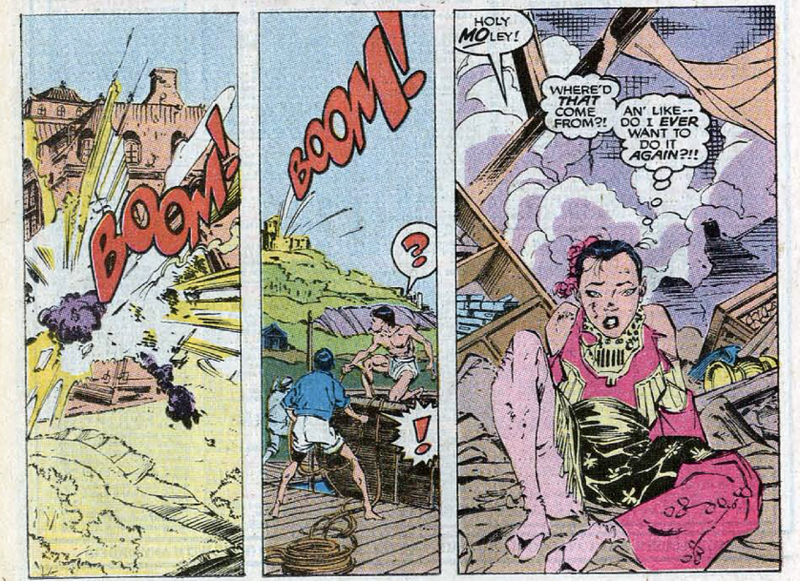 Also note Jubilee blowing up Mandarin's castle. This is one of the counterpoints used when Jubilee-haters go on about how "weak" and "lame" her powers are. And given the sartorial monstrosities that would be unleashed upon us in the 90s, the blue and gold costumes were rather tame. (By yeah, I think it was the "thong" part that unnerved people.) What I don't get is if these were Lee's idea, why did he quickly put most the team I individual costumes not long after this?